The Strategic Weapons Facility Pacific (SWFPAC) is a secret Navy submarine base in the Puget Sound, just south of Seattle. One of their primary work groups at this submarine base consists of 1,400 people who secure & service the submarines. > civilian government employees of all ethnicities in their 50's & 60's. Diverse to the max, all doing extremely meaningful work! Every year this group has a huge event to focus on safety, which they call a "SAFETY STAND-UP." It is the most important event of their entire year. Traditionally, their top three military leaders deliver presentations at this event, including the battalion commander. They've never hired an outside speaker before. This year they decided they wanted to "take a chance" -- [their words] -- and bring in someone from outside the battalion to help add some additional excitement to the gathering. They assigned the task of finding the right speaker for their event to Marine Sergeant Mike Curtis. Sergeant Curtis stands 6' 8" tall, and is a remarkably polite man, especially considering his several tours of duty in deadly combat conditions. His assignment description was to "find a speaker who could deliver a valuable operational message on teamwork and accountability, who could also entertain a very diverse group of people." Wow. That's a tall order! But my intention as a speaker has always been to combine valuable, productive, real-world content with interactive entertainment & laughter. So I do fit the profile of the speaker they had determined they wanted to find. Sure enough, Sergeant Curtis found me through an online search and gave me a call. We scheduled what turned out to be a lengthy pre-event phone discussion with the group Captain. 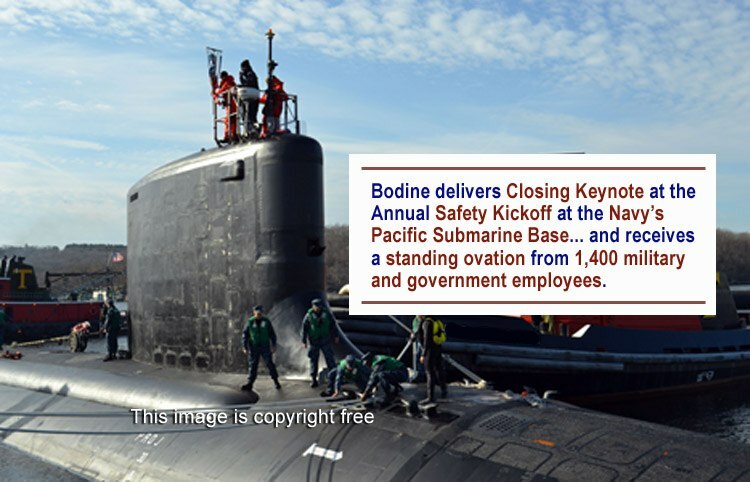 During that telephone call he emphasized how critically important teamwork and accountability are to the success of their ongoing safety standards and work campaigns on America's nuclear submarines. All of my client groups have important issues they have to address to be successful, but this was in a whole other category of being "critically important." I enjoyed that phone discussion with the Captain so much I felt like saluting when I hung up the phone! What a remarkable experience it was, on the day of my presentation at their extraordinary event, to be escorted onto that top-secret submarine base, to speak to that truly diverse audience at their mission-critical SAFETY event. I learned a long time ago how to turn the pressure to perform, into joyful motivation. It was thrilling to walk into that room, and I loved being with all those people, military & civilian, all ranks, and all ages. I shared some really valuable information with them about what I call "the true nature of teamwork & accountability." AND I also managed to add in some interactive fun & laughter with that audience during my presentation. I'M PLEASED TO REPORT: I received an enthusiastic standing ovation from all 1,400 of those people. And Sergeant Curtis told me afterwards, "Bodine, you influenced the hearts and minds of everyone." As a speaker, when the pressure is really on, there's nothing more fulfilling than connecting with the audience. And I think we all love hearing those kind of words from our clients . The kind of words that allow us to say to ourselves, "Mission Accomplished." HERE IS ONE OF THE MANY EMAIL COMMENTS the group Captain received from the event attendees . Sargeant Curtis shared this with me two days later . . . I wanted to let you know that this week's Safety Stand-Up was the best thing of its kind that I have ever attended at this command in the last 32 years﻿﻿﻿. I felt the comments from you, the Colonel, the Risk Management guys, and Bodine, the motivational speaker, were a wonderful start to the new year. Everyone that I have spoken with about it had great comments too. I consider that to be a major achievement.